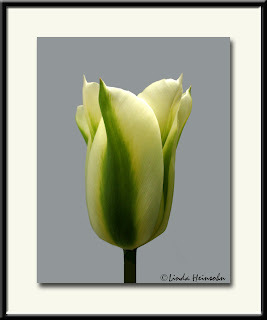 Spotted this tulip in a neighbor's yard yesterday, a drizzly, overcast day. The grey house made a perfect background for this tulip. I increased the size of the canvas in Photoshop and smoothed out the mottled basement stucco to blend in the new canvas parts. All that work made the shot look like a studio setup when it's actually not. It was just fiddled with in Photoshop Elements to highlight it's natural beauty.